Alligator facts. Learn facts about alligators that inhabit Florida freshwaters. Learn alligator safety tips and what provokes alligator attacks by Florida alligators. Although I spend 99% of my time on the beautiful Florida beaches, I do occasionally go to some of the parks around St Petersburg when friends want to throw a ball around or have a picnic with lots of trees. Every time I go to one of these parks where there is a lake, or freshwater canal nearby, the conversation always seems to turn to alligator attacks in Florida. And why not? If you are anywhere near fresh water in the state of Florida, you've got to assume that alligators are living there. Bill Eades, a friend of mine from the gym, put it best, "In Florida, there are even alligators in the bathtub." I swim in the Gulf almost every day...and rarely think of getting attacked by a shark, but you could not pay me Bill Gate's salary to swim across a lake in a Florida park. 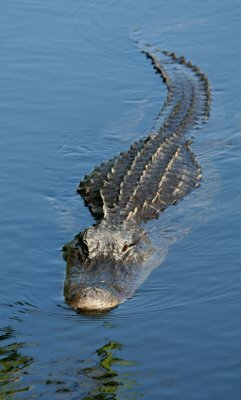 Before we go any farther, ALWAYS assume that any freshwater body of water in Florida is home to at least one alligator. * Alligators are most active between 82° to 92° F and start slowing down when temps reach about 70°...of course, there are always exceptions. Be vigilant in Florida. * During the cooler weather, alligators usually lay in burrows adjacent to the open water where they normally swim. Be alert if you are walking through brush near fresh water at a Florida park. * The average number of eggs in a Florida alligator nest is 35-50, but only about 15 of these will hatch...and only about 6 of those will live to be 1-year old. 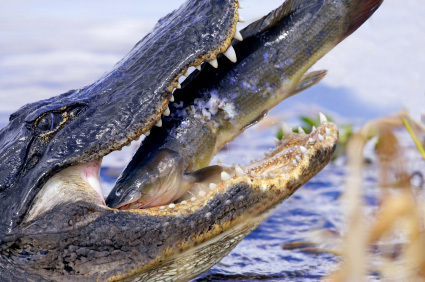 * Baby alligators are eaten by raccoons, large bass, birds...and of course, bigger alligators. * Female gators rarely reach 9' in length, while males average a bit over 11'. The largest Florida alligator (a male) is listed at 14'-5/8"...the heaviest one (also a male) weighed in at 1,043 lbs and was 13'10-1/2"in length. * Alligators in the wild, like the Everglades (or your nearest Florida park) can live to be 50 years old. * Gators are quick! I mean rattlesnake quick. Do not even attempt to get close to one of these things if you come upon one sunning itself on a cool winter day. * It has been recorded that a gator can outrun a horse for 30 feet. Unless you can move like Secretariat, keep your distance. * Alligators are NOT immune to bites from poisonous snakes like water moccasins, but their skin is so tough (an back armored) that snake fangs probably cannot penetrate it. * Gators have gotten into people's homes, been found in swimming pools on hot days, and have even been found on the launch site at Cape Canaveral. Don Glass, a retired teacher who lives in St Augustine, said, "If you are really interested in seeing a gator close up, head down to Shark Valley in Everglades National Park during the month of May. Go on a weekday, before school is out, so there will not be a crowd. Take the self-guided tour. Sometimes, there are huge gators laying right on the pavement. Once you see one of those giants about 20 feet away, you'll have that fascination satisfied. Nothing can prepare you be riding along the paved pathway, and have one of those things come out behind you. I've been to that park six times, and I have seen big alligators each visit." 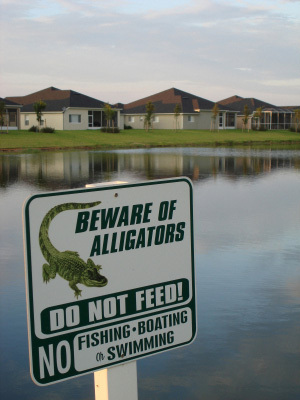 Facts about alligators are interesting to read, but...if you are on vacation here in Florida and you are near a lake, golf course pond, or any type of fresh water, NEVER allow your children or pets to get near them alone. 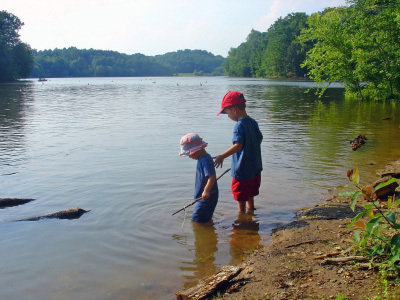 Barbara Hatch, said, "I never let my kids go near freshwater by themselves, until they were about 12. You can call me an over-protective mother, but there is just too much danger here in Florida. Look what happened to that 2-year old toddler who got eaten over at Disney World. Who would have thought something, like that, would ever happen? Alligators get into all kinds of places. They get into garages, under cars, they even get through screen arcadia doors into people's bedrooms. If you live here in Florida, just tell yourself that every pool of freshwater contains an alligator...and stay out of it." 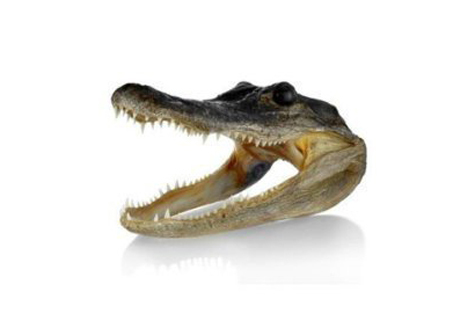 Genuine alligator head. Makes a great gift!